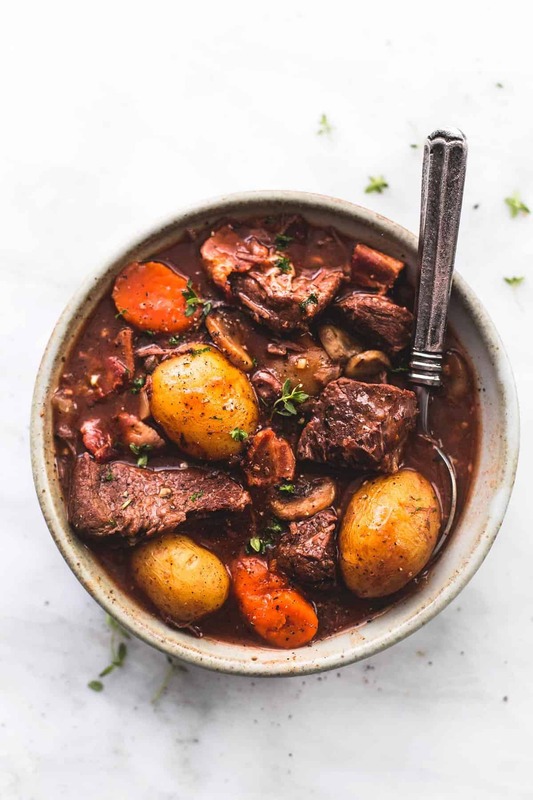 Pull out your pressure cooker and whip up this quick and easy Instant Pot Beef Bourguignon and enjoy savory fall-apart tender beef chunks and veggies. If Ina Garten and Julia Child created a beef bourguignon together – this would be it! I use my Instant Pot at least once a week! After this recipe be sure to try my ultra popular Instant Pot Pot Roast with Potatoes and Carrots or Instant Pot Chicken and Potatoes. You know how people buy treadmills and then joke that they are only there as decoration or as something to hold clothes on in your room? I am kind of starting to hear something similar about Instant Pots, which I can’t even believe. My Instant Pot is one of my favorite kitchen appliances and I almost can’t wait to try a new recipe in it. Even if it sits for more than a week, I start to look at it longingly and think up new recipes for the lonely little guy. 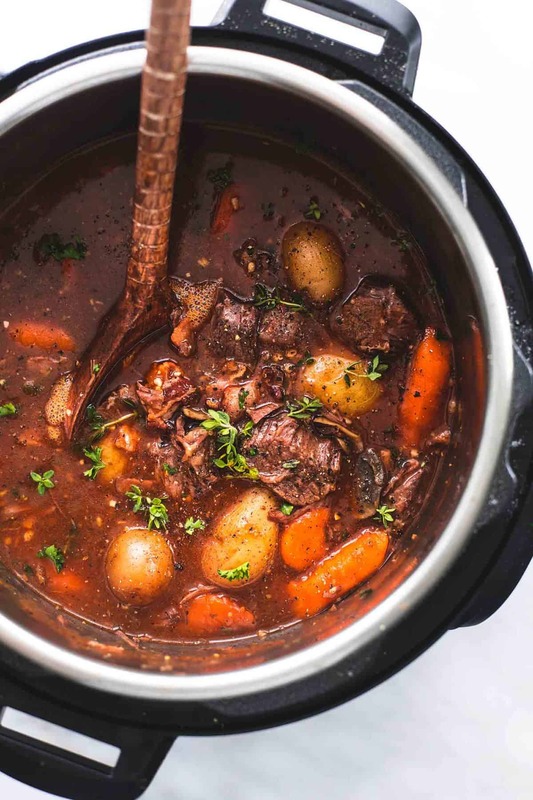 It might not sound very romantic but that’s how I came upon this recipe for Instant Pot Beef Bourguignon. Even though you might take one glance at the ingredients and the time (one whole hour? For an Instant Pot?) but it’s well worth all of it. Plus, a typical bourguignon recipe takes at four hours (FOUR!) from start to finish. There just aren’t many more shortcuts you can take or ingredients you can eliminate and still get this classic beef dish. Trust me, I’ve tried them all. The other reason for this dish is that, while my whole family loves chicken, sometimes we just crave a nice cut of beef. I wanted something with a hearty depth of flavor, a really meaty, filling, comforting dish. I have made this in the past the classic way and it just takes too much time. So, here we are! I’m not sure what Julia Child would say about this recipe, but I feel as though she’d applaud its ability to be quick and just as delicious as the original. Bourguignon refers to food that’s made the way the people of the region of Bourgogne, France, make it. Which, like all things you might associate with “burgundy” essentially means with red wine. 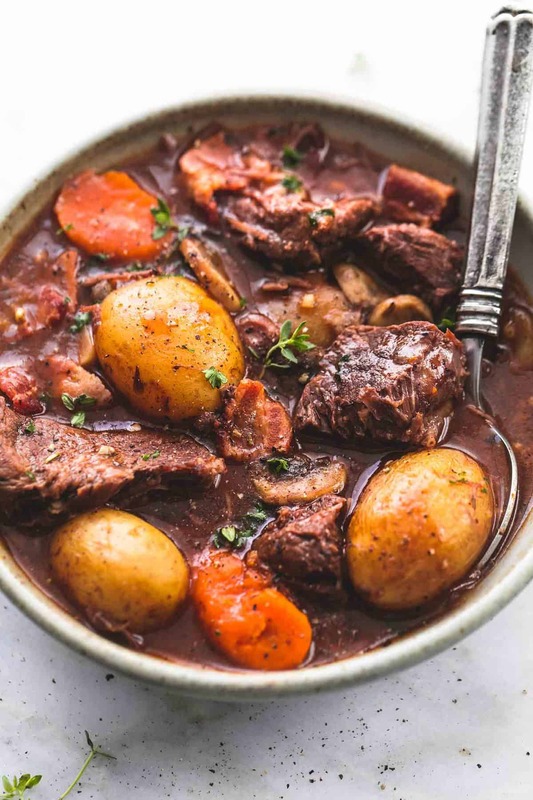 Therefore “beef in the style of Burgundy” means beef that is braised in red wine, alongside other ingredients like mushrooms, onions, bacon, and potatoes. The key to this dish though is the sauce, which is made with not only the wine, but the drippings from the bacon and beef, as well as the broth and flour, which create a roux or thickening agent to make the broth not so soupy and more easily mopped up with a big piece of crusty bread. WHAT SIDE DISHES GO WELL WITH BEEF BOURGUIGNON? A thick slice of sourdough or country bread slathered in butter. Rolls — either homemade or frozen. Mashed potatoes, like this recipe for Slow Cooker Buttery Garlic Herb Mashed Potatoes. That is, if you want to skip the potatoes in this recipe and also go crazy and use your slow cooker AND Instant Pot all in one day. Serve this dish over wide egg noodles. Add a side salad, asparagus, Brussels sprouts, or another hearty veggie. 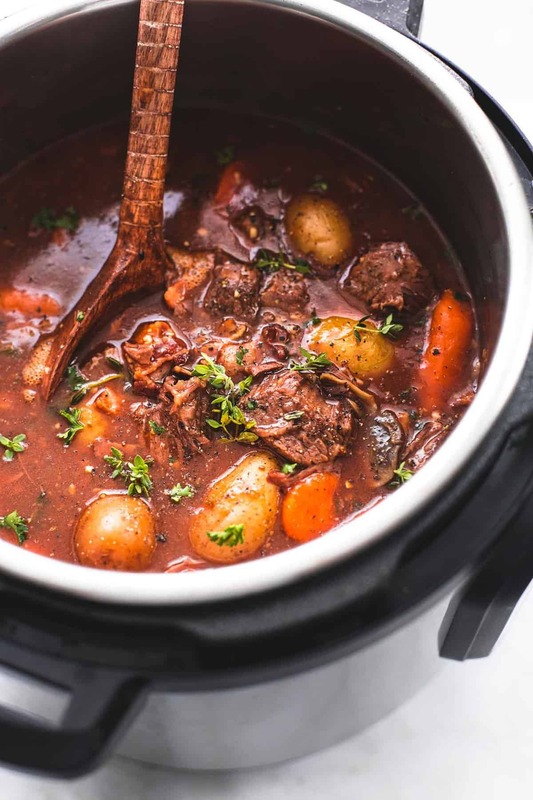 CAN I FREEZE BEEF BOURGUIGNON? Yes, this meal will freeze well once it’s made. You can keep it in an airtight container for up to three months. Be sure to label it and add the date that you made it. If you’re anything like me, your freezer is full of leftovers and meals for another day and you don’t want to lose track of how old something is. WHAT MEAT IS BEST FOR BEEF BOURGUIGNON? 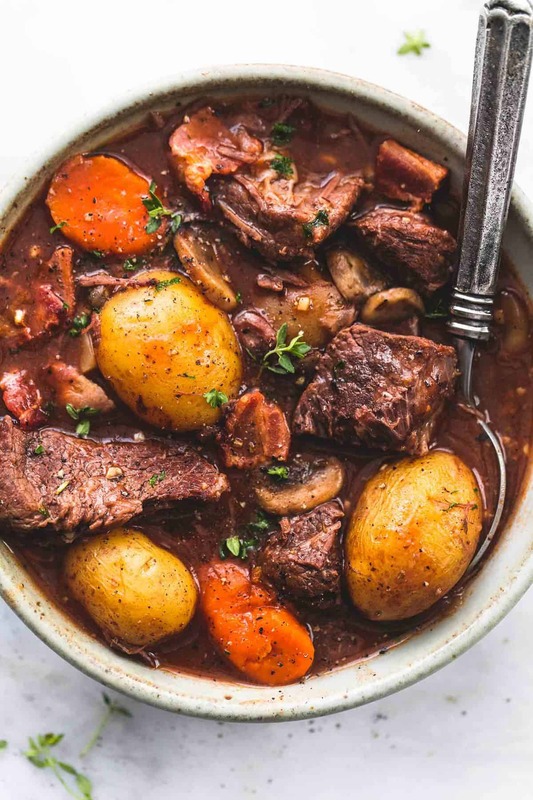 Since this dish is really a beef stew at its core, what you want to get a cut that works well being cooked slow and low (ignore the fact that this is an Instant Pot dish for the moment). That being said, I like to use chuck beef, but the shoulder, shin, or any braising cut will work. If you’re not sure, ask the butcher at your grocery store meat counter or go to an actual butcher who specializes in knowing which cuts of meat work best for every kind of dish. 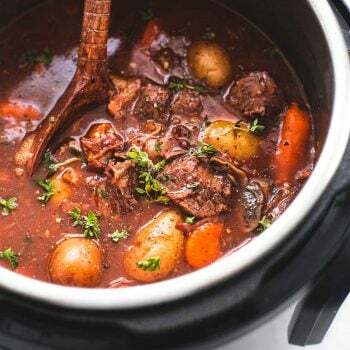 Pull out your pressure cooker and whip up this quick and easy Instant Pot Beef Bourguignon and enjoy savory fall-apart tender beef chunks and veggies. If Ina Garten and Julia Child created a beef bourguignon together - this would be it! Set instant pot to SAUTE. Drizzle with oil and sear bacon 3-4 minutes until cooked through. Use a slotted spoon to transfer to a paper towel lined plate and set aside. Add beef to pot and sear 3-4 minutes, using tongs to rotate periodically to brown all sides. Add red wine to the pot, scrape any brown bits off the bottom and sides of the pot and into the liquid. Simmer and reduce for about 5 minutes. Gradually add beef broth, tomato sauce, and boullion. Gradually whisk in flour. Stir in bacon, carrots, onions, garlic, thyme, potatoes, mushrooms, salt and pepper. Cover and set to PRESSURE COOK or MANUAL. Set to 45 minutes. Do a natural release for 10 minutes (do nothing, just allow to depressurize during this time) then switch valve to VENT and do a quick release. Once float valve drops, remove lid. Set to SAUTE again and allow to thicken for 5-10 minutes. Give it a good stir and taste before adding salt and pepper if needed and garnishing with chopped parsley. SLOW COOKER INSTRUCTIONS: Use a skillet on the stove over medium-high heat for steps 1, 2, and 3. In step 4, transfer everything from the skillet into a slow cooker, then cover and cook on low for 6-8 hours. Uncover, set to HIGH, and stir in corn starch slurry. Allow to thicken for about 30 minutes, then finish with step 6 as written. © Creme de la Crumb. All images & content are copyright protected. Please do not use my images without prior permission. If you want to republish this recipe, please re-write the recipe in your own words, or link back to this post for the recipe. Some of the links above are affiliate links, which pay me a small commission for my referral at no extra cost to you! 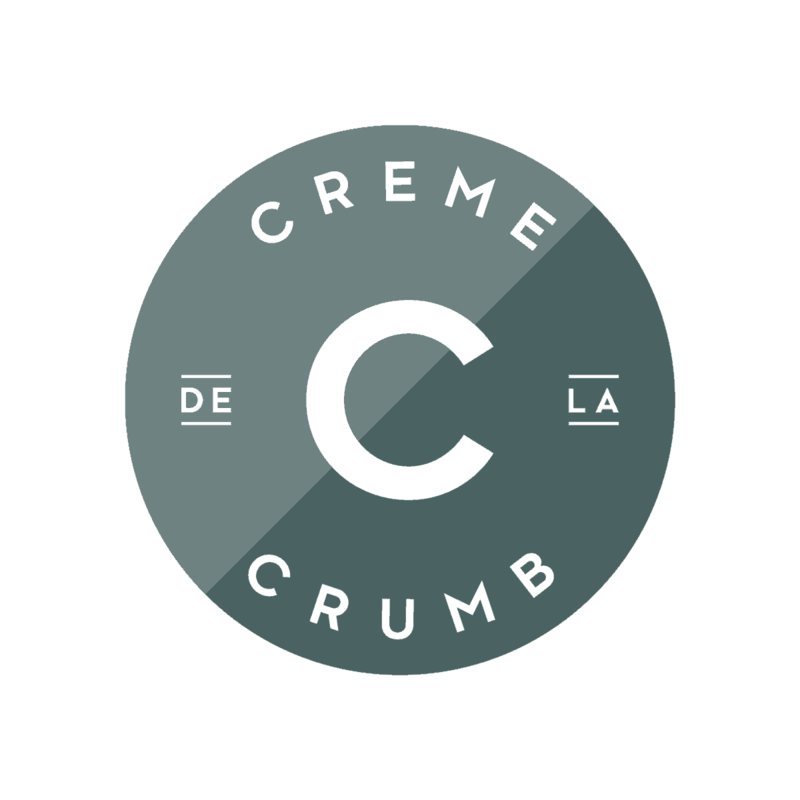 Thank you for supporting Creme de la Crumb. Hi Mary- I hope that you love this one! It’s SUPER delicious! Great job, Jennifer! Super excited to hear that you loved this recipe! You will be an instant pot pro before you know it! Do you have cooking instructions for if you use a crockpot vs instapot? Hi Tracy- I just updated the recipe notes to include slow cooker instructions! Darn it, you can probably just leave it out! I dont eat any pork and instead i us smoked turkey and it gave it a great taste and flavour . This is the best thing I’ve made in my instant pot. The meat was so tender. The sauce was flavorful. It was great. That is awesome! I am super excited to hear that you enjoyed this instant pot recipe SO much! Thanks for your feedback, Steven! hi tiffany! i love beef bourguignon, so super excited to try this one. i have a 3-quart instant pot though. i’m thinking that your original recipe here was meant for a 6 quart IP? so i think the best think for me to do would be to cut the recipe in half. are there any other adjustments you’d recommend? such as cutting down the cooking time, etc.? thanks! Hi Esther! I hope you love this recipe… but as far as cutting the recipe in half, you won’t change the cooking time! I prepared this recipe in an 8 qt instant pot. I think a 6 qt would work, too.. but I do agree with you and think a 3 qt instant pot would be far too small! So…I have a 6 qt ip, can i make the recipe without cutting it in half? You should be fine with a 6 qt! Just make sure to not go past the max fill line. I also made this with chuck, And it was delicious! The meat just falls apart. I served it over polenta with a little parmesan. THANKs for the recipe! Awesome job, Mark!! Thanks for your feedback about the meat you used! Fantastic job, Brenda! What a great Easter dinner. I am excited to hear that all of your guests enjoyed it!